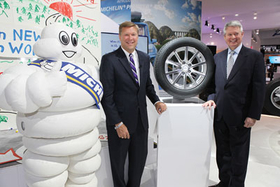 Scott Clark (left), Michelin North America Tire's chief operating officer, and Chairman and President Pete Selleck unveil Michelin's Premier A/S passenger tire featuring EverGrip technology during the North American International Auto Show. DETROIT—"Safe when new. Safe when worn." That's the tagline for Michelin North America Inc.'s Premier A/S passenger tire featuring EverGrip technology, which the tire maker said allows the tire to maintain traction as the tread wears down. Launched Jan. 14 at the North American International Auto Show in Detroit, the Premier A/S combines a new rubber compound designed for enhanced wet grip, hidden grooves that emerge as the tire wears down and expanding rain grooves that widen over time. During a news conference at the show, Scott Clark, Michelin's chief operating officer, called the technology the "next great advancement in automotive safety." "The typical family drives almost 20,000 miles each year with an average of two stops per mile," he said. "That's more than 40,000 stops per year, and when you think about it, the tires are only new for the first stop. That's why Michelin has spent a lot of time thinking about how we can improve the performance of worn tires, because, quite frankly, we all drive on worn tires." Michelin claims that a half-worn Premier A/S outperforms its leading competitors' brand new tires in braking during wet conditions, based on internal wet braking tests. In testing, Michelin pitted the Premier A/S in size 215/60R16 V—buffed to 5/32-inch tread depth—against new Goodyear Assurance TripleTred A/S tires and Bridgestone Turanza Serenity Plus tires in size P215/60R16 V and 215/60R16 V, respectively. Stopping results were averaged from multiple test runs on specific days, the company said. "We used to say our new tire is better than their new tire," Clark said. "Now we say our worn tire is better than their brand new tire." The Premier A/S—available in April in 32 sizes, ranging from 185/65R15 to 245/45R18—will be sold with a limited 60,000-mile warranty and will start with a manufacturer's suggested retail price of $156. The tire will be manufactured at Michelin's plants in Lexington and Greenville, S.C.; Ardmore, Okla.; and Pictou County and Bridgewater, Nova Scotia. In 2015, Michelin will expand the line with additional passenger sizes. "For the all-season line, we're at about 45 sizes currently, and we're continuing to evaluate the market and see where there's growth and where we might want to add new sizes," said Tiffane Thompson, Michelin country operation marketing manager. In addition, the tire maker is planning a fall launch of the Premier LTX, featuring SUV and light truck tires with EverGrip technology. Scott emphasized that the company will continue to introduce the technology in other tire lines. "That's the intent, that not only over time will we see EverGrip technology in other tires here in North America, but quite frankly in Michelin tires around the world," he said. For Michelin, EverGrip is a technology that's been more than a decade in the making, said Pete Selleck, chairman and president. "This is something we've been talking about for 15 years—about the fact that we design tires, the industry designs tires, basically to perform when they're new and then obviously the performance of the tire degrades," he said. One of the key elements of the Premier A/S featuring EverGrip technology is a set of 150-plus grooves, along the tire's shoulder, that are hidden when the tire is new and emerge as it becomes worn. These grooves, designed to assist in channeling water away and maintaining wet traction, have their roots in the commercial truck sector. In 2006, Michelin debuted the XDA Hypersipe retread that had molded tread features on both the top and bottom of a precure tread band. Sipes molded in the bottom of the tread appear as the tire wears, giving improved worn traction over the life of the retread. In 2007, Michelin brought the technology to new tires, launching the XDA5 drive tire, which incorporated patented design and manufacturing techniques that yielded a tread that reveals new grooves and tread blocks, giving the tire a second life—self-regenerating to improve wet, worn traction. "One of the interesting things about tires is there is technology that moves between different product lines," Michelin's Selleck said. The second element of EverGrip technology is a high-traction compound featuring "extreme amounts" of silica and sunflower oil, according to Michelin. The silica provides bonding strength and adherence needed for wet traction, while the sunflower oil allows for improved wet grip at lower temperatures, the tire maker said. "These ingredients are mixed through an exacting process that ensures a consistent material contacting the road, both when new and worn," the company said in a news release. The third and final element of EverGrip technology in the Premier A/S is expanding rain grooves positioned around the circumference of the tire, featuring a special geometric shape that widens as the tread wears down, Michelin said. This helps maintain the amount of water that the tire can channel away as rain grooves lose depth. Clark said one of the main keys to the success of EverGrip technology will be communicating effectively how the technology works to consumers. "We're all pretty close to the tire industry, and we think it's probably fairly intuitive that the performance of a tire degrades over time," he said. "That's not necessarily painfully obvious to all consumers. Quite frankly, they don't know how a tire's performance evolves, and it's one of the things that concerns them." One advantage of the Premier A/S is that the technology is something that can be seen. "Many times when new tires are launched, it's all about the science, and the stuff inside nobody can see," Clark said. "This is one of the few breakthrough innovations that has a visual aspect to it that is really compelling both to dealers and consumers." Michelin is developing point-of-sale materials for dealers, including a tread cut display piece that shows the difference in appearance between a new Premier A/S and a worn one.